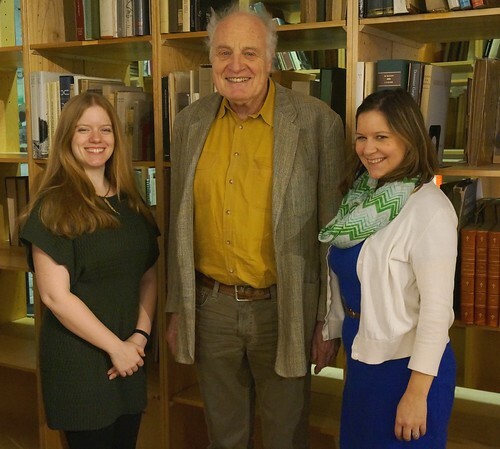 F. A. Bernett Books has been serving the needs of librarians, curators and collectors of rare, unusual and scholarly books on art, architecture and related fields for over 70 years. Erika, Peter and Melissa at 144 Lincoln St.
German-Jewish war refugees Frederick Alexander Bernett and Ilse Blum Bernett founded the company in May of 1944, taking a small office directly across from New York’s Grand Central Station. Having fled occupied France for the United States themselves just three years earlier, the Bernetts coincidentally issued their first stock list, France: History Art Literature, on September 1, 1944, mere days after Allied forces liberated Paris. Art-related titles sold particularly well, leading the couple to focus on rare & out-of-print reference materials on the fine and decorative arts, architecture and archeology. They drew on their common training as academic art historians (both Frederick and Ilse had completed doctoral studies at the University of Berlin) to guide the business, and soon became known as reputable dealers in the field. Post-war trade was brisk. To replenish their stock, Bernett made his initial buying trips in the Northeast. An American passport issued in October 1945 allowed him to become one of the first U.S. booksellers to travel overseas after the war, which he did often. With a knack for acquiring sought-after scholarly books — many of them in European languages — the Bernetts attracted a devoted clientele of university researchers and archivists, as well as curators at major art museums. The firm announced new acquisitions via frequent mail-order catalogs, at times issuing as many as five or six per year. Librarians at Harvard, Yale, Columbia, and the University of Chicago became frequent customers, as did curators for the Metropolitan Museum of Art, the Boston Museum of Fine Arts, and the Art Institute of Chicago. In 1949, F. A. Bernett Books became a charter member of the newly formed Antiquarian Booksellers Association of America (ABAA). The Bernetts moved their office from its original location in Manhattan to Larchmont, New York in 1953, where they settled to raise a family and continued to pursue the trade for more than 40 years. Peter Bernett joined the company in 1973, working as an assistant to his parents and traveling to meet one-on-one with collections development staff at key libraries and museums. As his father transitioned into retirement in the late 1980s, Peter eventually took over the firm’s buying trips in Europe. When Larry Malam joined the business in 1988, F. A. Bernett expanded its operations to include visits to Asia. Frederick Bernett passed away in 1993. Three years later, Peter — joined by his mother and Larry — moved F. A. Bernett Books to its current location in a former warehouse loft at 144 Lincoln Street, in Boston’s historic Leather District, where Ilse Bernett continued to work until shortly before her death in 2000. Larry retired after 27 years at the end of 2014. Today, with a staff including Erika Hapke and Melissa McCaffrey, we purchase and sell books globally via the web and in-person visits to dealers, archives and collections around the world. Under Peter’s guidance, our inventory profile has evolved from its original art-reference focus to feature an increasing number of unique and difficult to source books, periodicals, photographic albums, trade catalogs, artists’ editions, archives, and printed ephemera of interest to scholars and collectors in a variety of fields, including architecture, design, typography, fashion, jewelry, cultural studies, media studies, and history. For an up-to-date selection of notable new acquisitions, visit our blog at www.rectoversoblog.com. F. A. Bernett welcomes visitors. Should you happen to be in Boston, please give us a call or simply drop by and say hello.